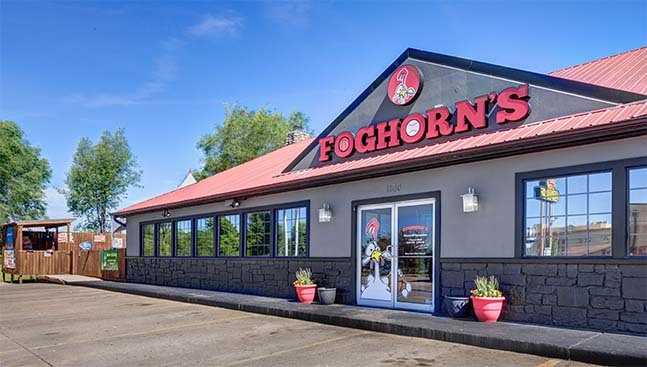 Following the purchase of a building on Sanders Road and multiple months of renovations, Foghorn’s is ready to open its newest location in Conway, and first outside of Northwest Arkansas. Owner Jeff Hodges opened his first Foghorn’s location in Fayetteville on March 19, 2004. 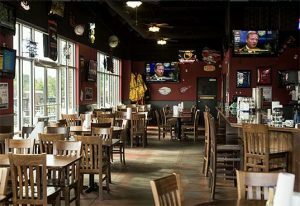 Since then, the sports bar and Arkansas original has expanded to six brick and mortar locations – two in Fayetteville, and one in each of Rogers, Siloam Springs, Springdale, and now Conway. Foghorn’s features a menu made for a sports bar king. With sandwiches ranging from a Foghorn’s Philly to a club sandwich, and burgers with salivating titles and toppings. 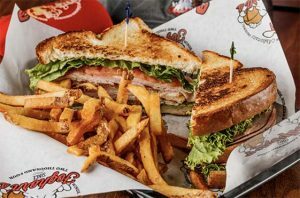 Like the Mac Daddy, which is a hand pattied burger loaded with their homemade mac-and-cheese, Swiss, American and pepper jack cheese, and a healthy drizzle of white queso. Or the Hawg Burger, which features a burger patty topped with smoked pulled pork, BBQ sauce, bacon and American cheese. If you are a vegetarian and want to pop over to Foghorn’s, they have you covered there, too. They have a black bean burger, fried cheese curds, fried pickles, salsa, queso, and fried mushrooms, as well as a Foghorn’s Salad. As plentiful as their menu offerings are, what Foghorn’s has built its reputation upon is their wings. Picking between traditional and boneless is the easy part. After that, you are faced with a choice between 50 different kinds of sauces to choose from. Some you will recognize quite well, like the Foghorn’s Hot, which is their traditional buffalo sauce. Others will certainly peak your brow, and your interest. Take for instance the Cryin’ Hawaiian, which forwards a sweet pineapple flavor that is followed by “a kick in the pants habanero flavor.” Or, the Pina Colada Punch that features a melody of coconut and pineapple undertones beneath the heat. Some other original wing flavors include: Acid Rain (most popular), Raspberry Chipotle, Peach BBQ, Death by Bacon, Spicy Peanut Butter, and Habanero Honey. 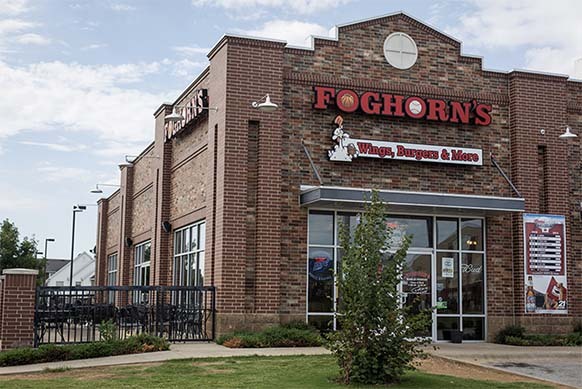 Foghorn’s #6 in Conway will occupy the location formerly tended by Outback Steakhouse, prior to their move to Oak Street. 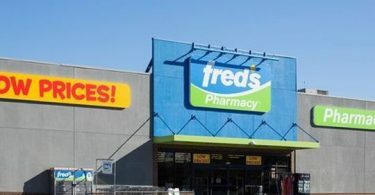 This location is right off the interstate from exit 125, and sits behind Wal-Mart, the Fairfield Inn and Suites by Marriott, and beside Tractor Supply, Co. 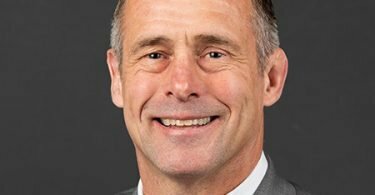 It is a great spot to be in the up and coming Conway, which factored heavily into Hodges’ decision to make the city his next stop for expansion. 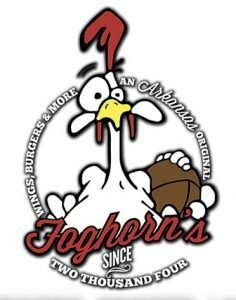 Foghorn’s Conway is set to open to the public on April 13. As fate would have it, this date finds significance, being just under a month after Foghorn’s celebrated its 15th anniversary.